The Robot Tiles provide an infinite walkway that might have applications in virtual reality. Credit: Hiroo Iwata. 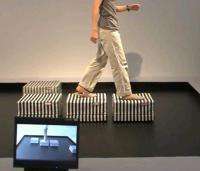 (PhysOrg.com) -- In a stroke of odd creativity, Japanese researchers have created robotic blocks that automatically detect where you're walking and position themselves in front of you before you take your next step. As a system, the blocks create an infinite walking surface, acting somewhat like moving stones as you cross an invisible creek. Hiroo Iwata, a professor at the University of Tsukuba, created the Robot Tiles. Each robot tile is covered with Kuralon EC, a touch-sensitive conductive fabric that detects pressure from the user's feet in order to predict the position of their next step. Ultrasonic sensors transmit the position and orientation of each tile back to a central computer that instructs the tiles where to go next. As the video [in Japanese] shows, users have to walk pretty slowly across the tiles in order to give them enough time to get into position. Although these Robot Tiles don't seem to have any obvious applications, Iwata hopes they could be useful for creating an infinite walking surface for virtual reality applications. hmm, this concept gets used in scifi movies all the time, I recall seeing it used in an episode of "Eureka" a couple of weeks ago. But real world application? Pretty limited. Still... its cool. Take a number of these, make them floatable and walk on water. Could be used as an impromptu bridge where premanently constructed bridges are not advisable (e.g. for aesthetic reasons) and where a ferry would be overkill. Neet stuff, i want one. I've seen this before and although I applaud the attempt, I don't think it'll become much of anything. The only way virtual reality would really work is to have nano-computers installed directly into our brains, which they are working on. This idea is okay (same with the omni-treadmill, and a sphere, I've seen), but people are going to be doing so many things in VR that you need to look out for their safety first. People in VR are going to be running, jumping, falling, etc. If there were thousands of these on a much smaller scale and being much faster, then maybe ... but VR of the mind is still an easier way to go. I can see something like this in perhaps an arcade or amusement park in the next decade for a limited run, but not really for home use. Robotic servants that anticipate our needs by sensing our intentions and then providing them in real time. This symbolizes the future of robotics, I love it. The omni-treadmill thing looked a lot better suited to VR applications. This looks rather pointless at the moment, even though it looks cool. Something like this is needed for 3D virtual environments. The experimenters are rather limiting their vision in accord to their funding. If the blocks move too slowly, just add more blocks.